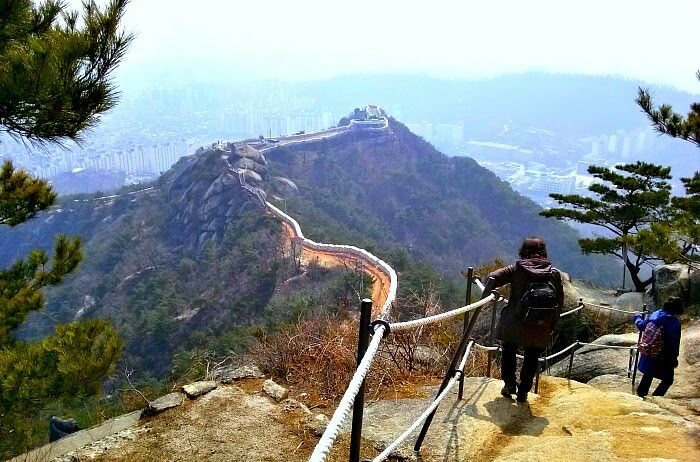 I hiked Inwangsan Mountain Trail in early spring last year with my colleagues with much excitements. It was part of our outing activity to see historical sites especially those related to people who struggle for human freedom. It was a refreshing spring day. The sun was bright, and a clear day. We took off from Sodaemun area and walked all the way to the foot of Inwangsan, which is located in Seoul area. It was a pleasant walk and not far from our office. We past by the walls on our way up and could see a few traditional Korean houses. More modern apartment and higher buildings are becoming more obviously invading the spacious areas of the old Seoul. As you start climbing up the lower part of the mountain, you'll notice the lower height walls. 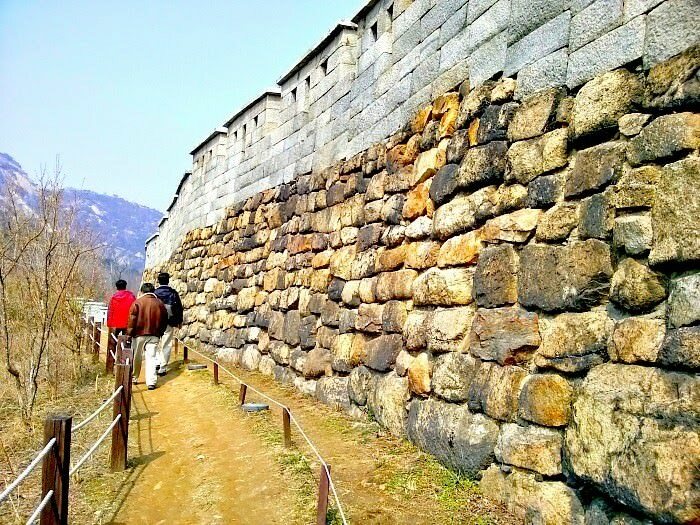 These are the old Seoul City walls (formerly called ‘Hanyang’) which the ministry of tourism is promoting by renovating them. Reconstructing the old city walls would not only attract hikers and tourist but also relived the memories of the past struggles of the people. Of course, I can imagine how people in the past crisscrossed that same road and mountain paths. I can imagine ordinary people walking (or riding) with their cows carrying heavy loads on their way either to the markets or back home. 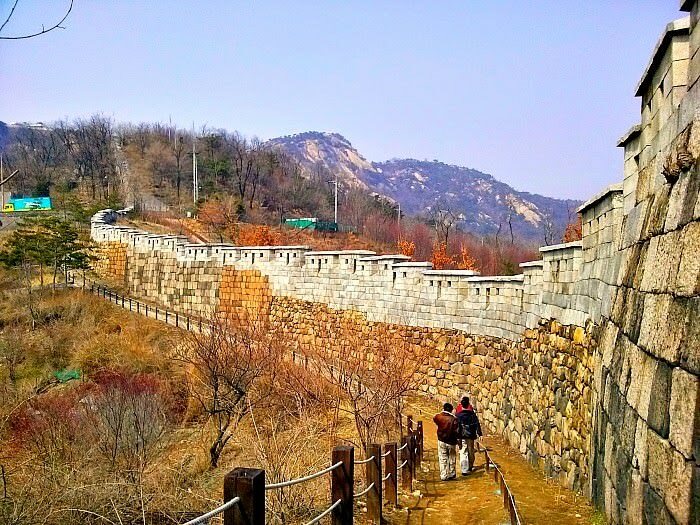 Close to Inwangsan (Inwang Mountain), you can find ritual sites of King Sejo and some castle walls that stretch from Sajik Tunnel to Jahamun. Inwangsan Mountain is more than 300 meters high and tops over Hongdae District, Sodaemun-gu, Muak-dong, Nusang-dong, Ogin-dong, and Buamdong in Jongno-gu. The mountain's name literally means "mountain of a generous king" in the Korean language. This mountain approximately covers about 1 million square meters. 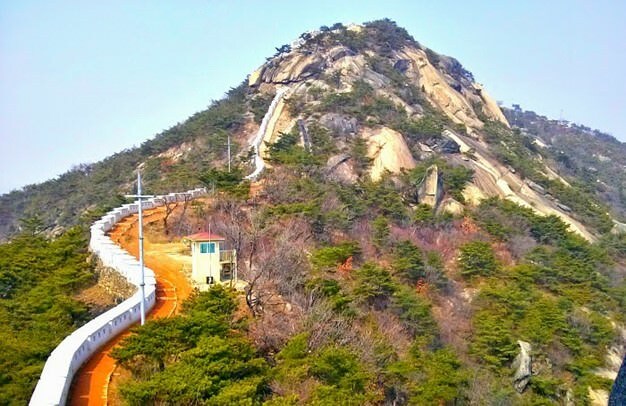 Just like most mountains in Korea, this mountain is mostly composed of granite elements. You can obviously observe the granite boulders showing off at the sides and piling up on top of this mountain. These granite boulders have various and fascinating shapes and forms. Typically, Koreans, just like most humans throughout the world would do, associate some shapes to images and create meanings in them. For example, there are granite rocks that they call train rock (kicha bawi), skirt rock (Chima bawi), hat rock (moha bawi), among hundreds of shapes and forms that one can associate and create meaning with. 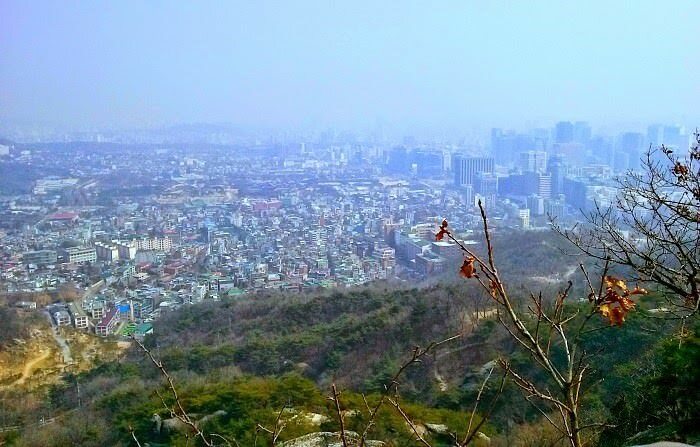 That makes hiking this mountain an interesting experience aside from the nice view of Seoul and the surrounding districts. Inwangsan is famous not only among its hikers who can have a great view of Seoul and its surrounding districts but since time immemorial. Famous painters depict this mountain in their paintings where you can find in many museums established in Seoul. For example, the famous painter Jeong Seon who painted "Inwang jesaekdo" (translated as "After the rain at Mount Inwang"). The painting was painted during the reign of King Yeongjo of Joseon Dynasty in 1751. You can find this great painting at the Ho-Am Art Museum in Yongin, Gyeonggi Province. In addition, the Fortress Walls of Seoul envelops Inwang Mountain where you can also find the tourist sites--Inwangsa (Inwang Temple) and Guksadang Shrine. Most temples attract foreign visitors, like me, due to various reasons such as its sense of tranquility, divine presence... you can add more! Guksadang is a shamanist shrine. This shrine houses the spirits of Joseon Dynasty's King Taejo and other generals. Guksadang was first built in Namsan Mountain (in 1395) but got destroyed during the war in 1925 and restored where it is located now. Take Gyeongbukgung Station-Seoul Subway Line 3, Exit 3. Then go straight ahead for about 90 meters to find Gyeongbukgung Bus Stop. Take Bus #09 and then get off at Ogin Apartment complex. From here, it will be about 600 meters to Inwangsan Mountain. With confidence, there are many points of origin and directions depending on your choices and point of origin or where you live or start from. So, there is so much to see in this favorite mountain, although honestly, I've haven't yet explored all of them. That would be part of my update then for this page! Thanks for reading through and hope you'll visit this blog more often to discover more about this mountain and anything interesting about Seoul and South Korea in general.